Comments: The Y-Wing is a sturdy fighter-bomber flown by Rebel Alliance pilots in their fight to save the galaxy. Durable and reliable, Y-Wing fighters fought in the Battle of Yavin, where they helped defeat the Death Star threat. 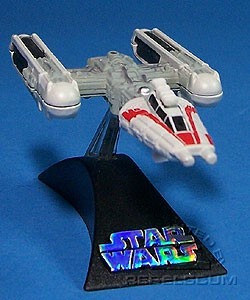 This version of the Y-Wing is painted in a red color scheme.